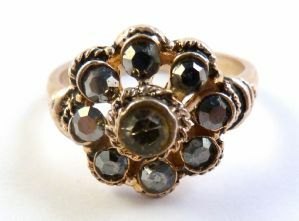 Vintage Hematite Set Floral Cluster Dress Ring. Vintage hematite and rhinestone floral cluster dress ring. Vintage hematite set, floral design dress ring. Formed from gold tone metal, set with faceted hematite and a raised rhinestone to its center forming a floral design. The ring is a UK Size R, US 8 5/8size . Ring Size UK R, US 8 5/8. Hematite and rhinestone floral cluster ring.